Dr.B.R.Ambedkar 125th Birth day Celebrations on 26th November 2018 in AP Schools : Celebrations of 125th Birth day of Dr.B.R.Ambedkar on 26th November 2018 Proceedings Of The State Project Director, Sarva Shiksha Abhiyan, Andhra Pradesh, Amaravati.Present :- Sri G.Srinivas, I.A.S., Rc.No. 135/A3/APSSA/2018, Dt.-11-2018. Sub: APSSA, Amaravati - Quality Education -Celebrations of 125‘ Birth day of Dr.B.R.Ambedkar on 26th November, 2018 regarding Constitution of India in Government Offices and Government Schools - Conduct of Celebration to identify the Constitution of India importance- Further instructions - Issued. Ref:-Govt. Memo.No.692810/Prog.B/2018, dt. 22.11.2018 of Government of Andhra Pradesh. All the District Project Officers of SSA, and District Educational Officers in the State are informed that, “the Government of Andhra Pradesh has informed that, the GoI has conducted Celebration of the Birth day of Dr.B.R.Ambedkar at the first time in 26th November, 2015 in India as “CONSTITUTION DAY” and decided to conduct of the said Celebrations in every year on 26th November in India. In view of the above, the Government of Andhra Pradesh has issued instructions to all Secretaries/ HoDs/ District Collectors/ Registries of the Universities to conduct of Celebrations of 125th Birth day of Dr.B.R.Ambedkar on 26th November, 2018 “CONSTITUTION DAY”of India in Government Offices and Government Schools in the State regarding to conduct the cultural activities like the Mack Parliament , Essay Writing, Elocutions, Cultural activities regarding to identify the Constitution of India importance and implement the orders of the GoI. Therefore, all District Project Officers of SSA, and District Educational Officers in the State hereby directed to implement the orders of the Government of India and conduct of Celebrations of 125th Birth day of Dr.B.R.Ambedkar on 26th November, 2018 “CONSTITUTION DAY” in the Government Schools without fail. As a part of the said Celebrations to issue necessary instructions to the all schools of in your district to conduct the cultural activities like the Mack Parliament, Essay Writing, Elocutions, Cultural activities regarding to identify the importance of the Constitution of India. 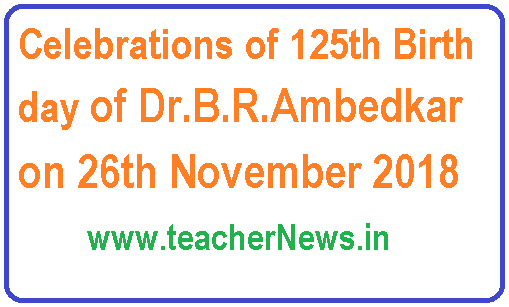 Dr.B.R.Ambedkar 125th Birth day Celebrations on 26th November 2018 in AP Schools - Celebrations of 125th Birth day of Dr.B.R.Ambedkar on 26th November 2018.